When someone visits the Newbury Gardens Day Nursery website we use a third party service, Google Analytics to collect standard internet log information. We do this to find out things such as the number of visitors to various parts of our website. This information is processed in a way which does not identify anyone. We do not make and do not allow Google to make any attempt to find out the identities of the people visiting our website without your consent. 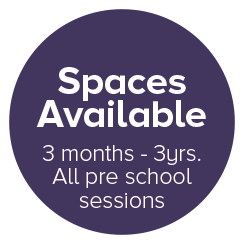 Newbury Gardens Day Nursery use a third party service to help maintain the security and performance of our websites. To deliver this service it process the IP address of visitors to the website. We will only use this information to maintain the security of our own website. Newbury Gardens Day Nursery tries to be as open as it can be in terms of giving people access to their personal information. Individuals can find out if we hold any personal information by making a ‘subject access request’. If we do hold information we will: give you a description of it; tell you why we are holding it; tell you who it could be disclosed to; and let you have a copy of the information in an intelligible form.